Please be very careful with fire! You should never throw cigarettes out of car windows, because only a little spark is needed to start a big fire. Be very careful when using a barbeque and make sure you have a bucket of water at hand. The local health centre, located opposite the church, is open daily, but the doctor is not present all the time. There is a private general practicioner in the village, Dr. Domingos Francisco. An appointment can be made at the pharmacy. The pharmacy (Farmàcia Nova) is located near the church, next to Café Central, telephone: 282360000, fax: 282360001. It is open every day, except Sundays, from 9.00 to 20.00 hours . The shops are open between 9.00 and 19.00 hours and generally close for lunch between 13.00 and 15.00 hours. every last Saturday of the month, Azinhal - Alte. Very nice farmer´s market. Every day there is fresh bread for sale. Every Wednesday and Friday at the church square around 10.00 a.m. you can buy fresh fish. Every Thursday afternoon there is a van with frozen food passing through. Every Thursday afternoon you can buy fresh vegetables of the season. Opening hours: 9.00 - 13.00 and from 14.00 - 18.00 hrs. The railway station at the entrance of the village has been closed. The nearest station is in S.B. de Messines (15 km). Up to date info on public transportation (EVA buses) you can find here. João Marques drives a taxi in São Marcos da Serra. 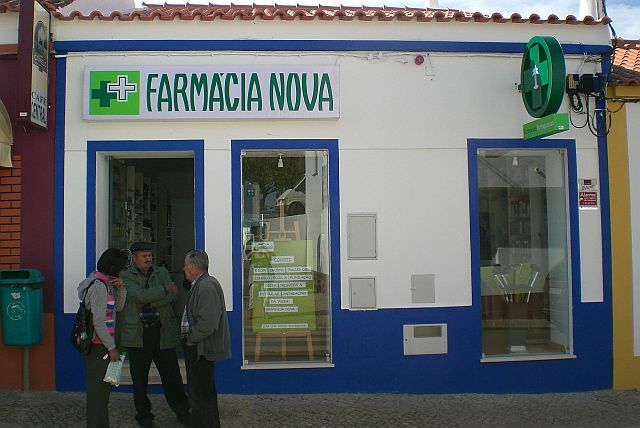 You can find him at the Drogeria "a Nova". There is is Galp service station at the IC1, direction Albufeira, about 1 kilometer after the crossing. For a listing of local businesses, please look at the page "the parish"
Easter weekend: feira do folar in S. Marcos, with easter cake, traditional products and live entertainment. 25 April - day of the Saint patron of the village: S. Marcos. Also this is Liberty Day.